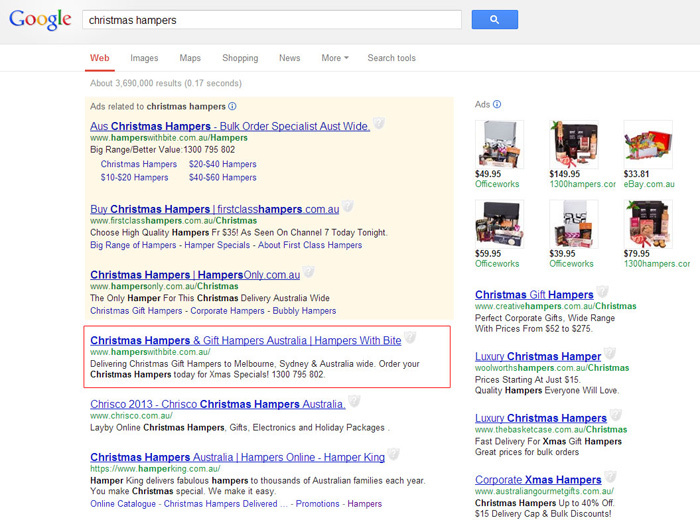 If you have ever looked for Christmas Hampers on Google, you would have come across Hampers With Bite, a rankONE SEO client that has been at the top of Google for the last 6 years in a row. During the last 6 Christmas’s, this website has received 92,870 visits into their website, with these sort of number coming into their site, they also had 472,419 page views. Just to break down how we got these numbers, they have come direct from Google Analytics and have been taken from November 8th to December 23rd for each year, each year we have seen an additional 5,000-$10,000 extra visits increase and this year. Breaking it down even further to show the value of SEO, 86% of the traffic was organic, 5.7% of the traffic was direct (ie www.hamperswithbite.com.au), 5.4% was adwords pay per click and 3% was from Bing/Yahoo – Bing traffic was most of that percentage as it was over double the amount of clicks. Here is a screen shot from today 28/11/2012. Top of adwords (5.4%) and Top of organic (86%). Another proven result about how SEO can help your business. If you would like your business in this position, please call us on 1300 614 892.